The 2017 Volvik World Long Drive Championship is back at WinStar World Casino and Resort! Volvik is the new event sponsor this year and you are in for a treat. 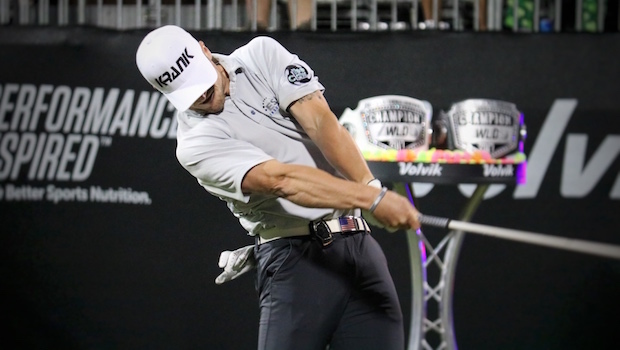 Be sure to mark your calendars for this exciting event on September 5-6, when the best long drivers from around the world will play for the sought-after World Long Drive Championship belt. Admission to the championship is free, so head out and enjoy the electric atmosphere and be amazed as the competitors hit golf balls 400+ yards to win the prize. The drivers swing at more than 150 mph and the ball speeds can reach upwards of 220 mph. It’s extremely impressive, to say the least! You don’t need to be an expert golfer to enjoy this event; there is fun for everyone. Not only will you have the opportunity to watch the competition, there will also be food trucks, giveaways, and a performance from country star Colt Ford! The women’s championship will take place on September 5 and will be broadcast live on Golf Channel for the first time ever. The men’s championship will take place September 6 and will also be aired live on Golf Channel. Grab your competition-loving friends who like to have a good time and make a trip out of it! Enjoy the championship and book a stay at the world’s largest casino. If you’d like to get some practice on the golf course or driving range, check out the WinStar Golf Course while you’re here. You may also run into Jon Stephenson, Director of Fitting at the WinStar Golf Academy, who competed in the 2016 World Long Drive Competition. He can fill you in on all the fun facts and information about the competition. Get your tickets and come enjoy great company, delicious food, and a fascinating competition at the 2017 Volvik World Long Drive Championship at WinStar!